Flat shoes are undeniably chic and sophisticated, making them a wardrobe staple. Their simple, flat design relieves feet of pressure that heeled shoes cause the foot and ankle. In addition to offering comfort, the flat shoe has a wide range of cute styles available that can transform any outfit from bland to fabulous. Looking fabulous in flats is not hard to pull off. You can pair flats with almost any item of clothing during any time of the year, but these shoes are especially popular for wearing in the warmer seasons. Choose a lightweight shoe fabric to pair with a spring or summer skirt. Flat espadrilles with a canvas material, such as the Soludos esparadrille slip-ons, look amazing with skirts. When pairing the flat shoe with a skirt, you will want a skirt that is no longer than your knee. Choose a simple T-shirt or tank top to pair with the skirt and flats. Pick a romantic flat such as the Genevieve by Chinese Laundry to pair with a skirt for a special night out. Flat shoes with additional detail, such as sequins or rhinestones, draw attention to the feet and add a special touch to a more dressy outfit. Choose a lightweight, white linen skirt and frilly top to wear with a romantic flat shoe. Flats are ideal to wear with jeans because almost any type of flat works well with pants. Wear trouser jeans and a bold, solid shirt with a funky leopard print like the Edie Toe Loafer to draw attention to your feet. Pick a flat in a trendy hue, like the teal Bandolino Women's Flat, to wear with white or dark skinny jeans and a tunic. In addition to pants, oversized sweaters or a tunic mix well with leggings and a stylish flat shoe. In addition to jeans, the flat can also work well with a simple suit. Skip the high heels for the office and wear a pair of smart-looking flats to work. Flats in mute colors such as tan, black and mild patterns work well for strict office dress codes. If your office has a more lax dress code, you can mix your suits with a bold flat, such as the Minnie Ballet Flat by Tory Burch. Like pants, flats can be worn with shorts and dresses on a hot summer day. Shorts may call for a casual open flat such as the Vaneli Andie. When wearing a flat in a bright color, keep the rest of your outfit simple. Laid-back white shorts and an embellished tank top will help balance the color of the flat. Like skirts, keep the dress short and sweet. Pair a glittery flat with a white cotton sundress. A cool, yet cute, neutral flat is the Easy Spirit GetCity ballet flat, available in gold. When shopping for flats, remember that you do not have to choose comfort over style. Many designers go above and beyond the traditional to deliver cute and fashionable flats that mesh with any wardrobe. Look for originality, such as oversized bows, grommets, studs, buckles, beading, patterns and textures. Depending on your location you may have a limited number of stores around you for in-store shopping. Take advantage of Internet shopping for both major brands and retailers, and Internet-only shops. DSW specializes in carrying a wide variety of shoes from different name-brand designers. The pricing is competitive, and they offer several sales throughout the year. In addition, DSW offers a free members card for shoe lovers. This card allows women to gain points for every dollar spent to use on future purchases. 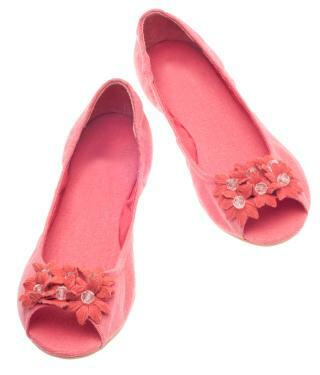 They carry adorable flats from brands such as Chinese Laundry, Nine West and BCBG. Macy's is perfect for the chic fashionista who prefers designers without breaking the bank. With flats from brands such as Coach, Kenneth Cole and Lucky, Macy's is an ideal place to find a wide variety of flat shoes in different patterns and styles. Neiman Marcus is a high-end retailer specializing in designer flats such as Chanel, Prada and Kate Spade. There will always be a large selection of designer flats on display at this popular retailer. A fashionista's fantasy, Lulu's is an online store that offers a large selection of cute flats. Their prices are easy on the pocketbook and their style is very fashion-forward. In addition, Lulu's offers fashion advice on how to dress with flat shoes. At Forever 21, you'll find a wide assortment of trendy flats with very inexpensive price tags. Throughout the year, Forever 21 also offers by-one-get-one half price sales. Cute flat shoes are a must-have for both girls and women. Style, versatility and comfort are among the top reasons a woman makes a shoe purchase. Start shopping and trying on flat shoes to see what shoe works best for you. Often affordable, easy on the feet, and very wearable, fun flats are a great way to incorporate current trends and adorable elements into your shoe collection.